Fashion is continuously evolving and there are loads of trendy blouse designs for brides to choose from. 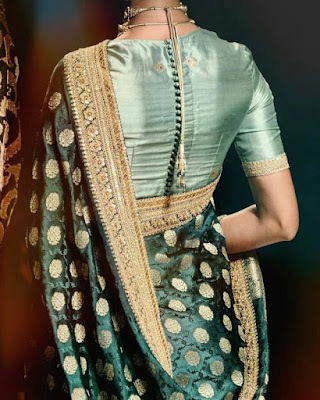 Most brides wear lehengas for their wedding but there are some brides who pick sarees (mostly south Indian brides) and for them I have put together this post with latest blouse back designs. While brides give a lot of though into their bridal saree, their bridal blouse is often neglected which is a very wrong thing to do. Most of your photographs will have just the upper half of you in focus so you need to put effort into making your blouse fabulous. Also a beautiful blouse with right fit and cut can help you make an effortless fashion statement on your big day. 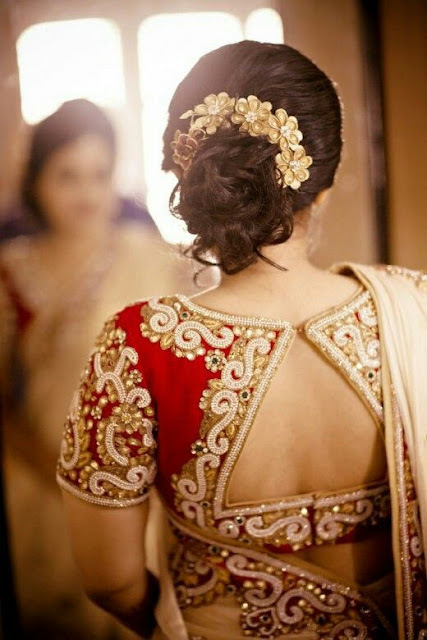 Bridal blouse designs need more emphasis on the back rather than front because not much of your front blouse portion will be visible as you will have a traditional saree drape and be wearing a lot of jewellery and garlands. 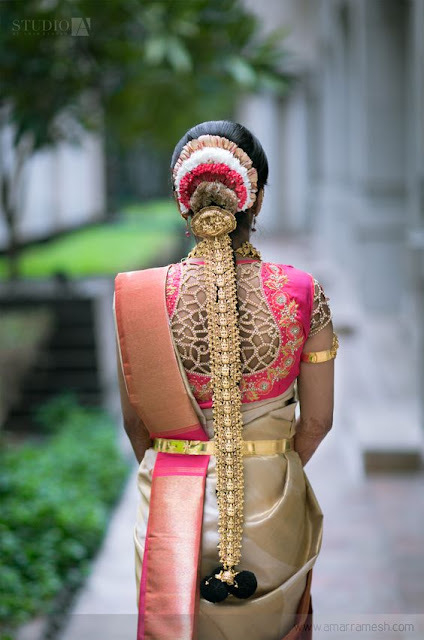 Hence here I am suggesting you some latest blouse back neck designs for bridal sarees from where you can take some inspiration for back neck pattern of your saree blouse. 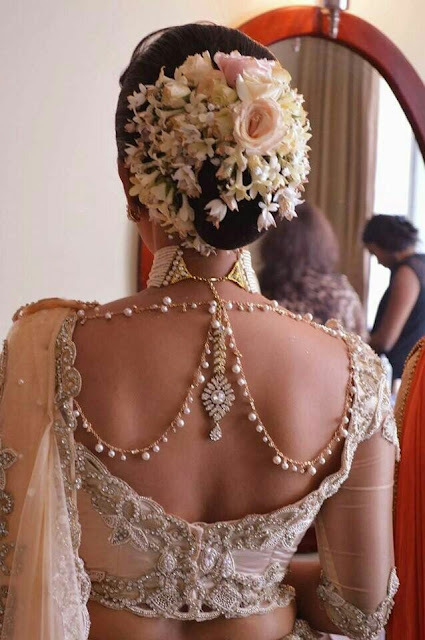 Wearing jewellery on the back of your blouse is the latest trend ruling wedding blouses. This body jewellery kind of trend has been done by rajput and mughal princesses and now you can also do it for a regal saree look. If you want to try this latest jewelled back blouse trend go for a blouse which has a simple or classic back cut like a wide U or V and layer your preferred jewellery. Try a glam neck piece that can be fitted to your bridal blouse or just go sophisticated by layering strands of pearls for a gorgeous back look. Latkans aka tassels enhance the beauty of saree blouses but for your wedding try something different and get the tassels attached to a huge cut out at back of your blouse design instead of trying the usual doris. Dont forget to get the back and sleeves embellished or embroidered for added glam. Mirror work blouses look chic and festive. A circle cut blouse back designs with mirror work all around the cut will look every bit bridal and stunning. You can go for half or full sleeves as per your taste but make sure to add some mirror work even on the sleeves. If you want to keep things subtle but still trendy becuase well it is a wedding then go for two small circl cuts on a printed blouse and finish off with tassels. This kind of blouse back designs are sure to make a statement without looking over the top. Peplum style and sorset style blouses are super hot in trend these days and it makes sense to include a blouse design like this in your wedding trousseau. 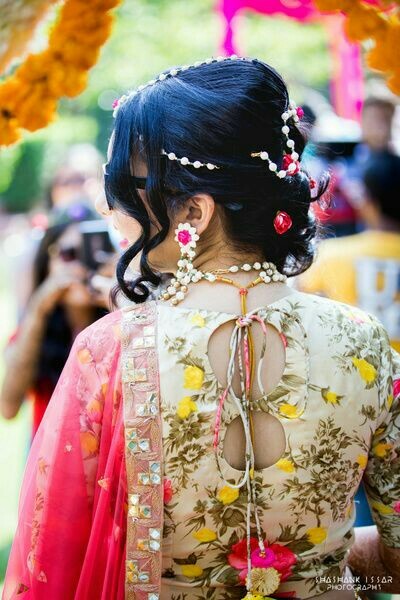 Ofcourse not everyone can carry off an unconventional blouse like this but if you are one of those experimental stylish brides do give a peplum style blouse a try for your mehendi or sangeet. Bridal look is supposed to be overoaded and crowded with lots of jewellery and to play it down you can opt for a simple blouse back neck design. Go for open blouse back designs with tie up detailing in the bottom part of blouse for a trendy look. Bird motifs are quiet big this season and I have spotted many brides with these motifs either on their sleeves or baclouse backs. Go for an embellished bird motif blouse back with cap sleeves and embrace tradition the gorgeous way. Open back blouses are not for traditional weddings but you can still show a little bit of skin. This blouse design with lower cut out gives illusion of a cropped top and has some very fun vibes. You can try this blouse back design for your wedding with a bit of embroidery on sleeves or just wear this blouse with playful tassels for your mehendi or haldi. 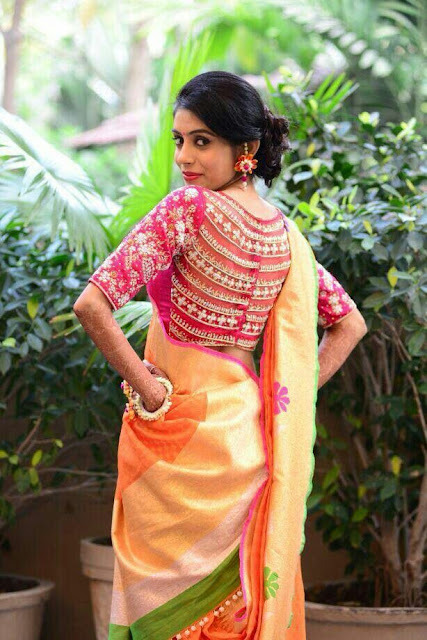 Double knot blouse back design looks classic and can be paired with all kinds of wedding sarees including silk sarees. This kind of blouse back neck design is perfect for young brides. Which bridal blouse back neck design do you like most?